NHL history is filled with transactions of all shapes and sizes, and in the grand scheme of things most of them end up being fairly meaningless. But several times a season, whether or not we realize it at the time, a team will make a move that reverberates for years or even decades. Most of those deals are firmly imprinted in fans’ memories. Twenty years later, many Flyers fans can still recite the Eric Lindros trade by heart. The average Habs fan can’t go more than a few hours in their day-to-day lives without being reminded of the Scott Gomez deal. Entire sections of Toronto newspapers were dedicated to daily rehashings of the Phil Kessel–Tyler Seguin trade (at least until it started looking like a good move, at which point it was mysteriously forgotten). 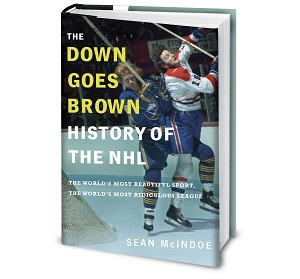 But then there’s the other side of the coin: those trades and transactions that helped alter NHL history but, for whatever reason, have been largely forgotten. Now, obviously everyone’s mileage will vary a bit here; if you’re a die-hard fan of one of the teams involved, these “forgotten” moves may not be especially forgotten at all. But for many fans, these history-altering deals have been filed away in the cluttered attic of their memory banks — if they’ve ever heard of them at all. The way I've always heard it, New Jersey planned on taking Brodeur no matter what. They knew he was their guy, not Trevor Kidd. So they took Kidd out on the town. Fancy dinner. Etc. etc. All to make Calgary think there was no way they were getting Kidd at 20th. So Calgary traded up to get Kidd, giving the Devils an extra pick and the guy they always wanted anyways. The NHL's concussion lawsuit is here. Now what? Division of Zeros: Why is the Metro so terrible?